From time to time we welcome other librarians to Ford. Usually our visitors include fellow business or university librarians from the States with an occasional visitor from Europe or East Asia. However, last week we hosted three librarians from Nazarbayev University located in Kazakhstan’s capitol, Astana. Their long trip began last year when the Fuqua School announced it would assist Nazarbayev in creating a business school, an essential institution for a country with a growing market economy. So with that announcement, many Fuqua departments, including the Ford Library, began mapping out the resources needed by a top business school. For our guests, however, it meant seeing how we operate at Ford as well as other Duke libraries including Perkins, Rubenstein, Lilly, and the Goodson Law Library. In addition to Duke, they also visited UNC-Chapel Hill’s campus libraries and their School of Information and Library Science. Between visits we made sure to take them to some of the area’s popular sites such as the Nasher Museum, the Sarah P. Duke Gardens, and even a shopping trip to a local mall. During their visit, we showed them how we order from our vendors such as YBP, and how incoming books were processed. They also had the chance to meet the Slavic acquisitions specialist at Perkins, plus see how librarianship is taught at UNC. 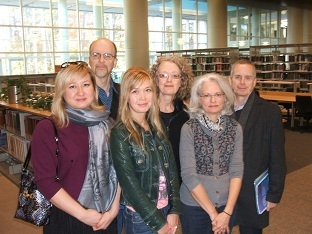 From our visitors, we learned the challenges of starting a new library in a post-Soviet economy. For example, ordering books required knowing which books you planned to purchase over the next year, quite difficult when the books haven’t been published. Plus the books had to be ordered from government approved vendors who may or may not be able to ship the titles when needed. Even with these hurdles, they maintained their enthusiasm for their developing library, university, and country. But throughout, they were excited to be involved, excited to learn new library workflows, and excited to meet the staff. As we move forward, we look forward to our continued mentoring relationship with our colleagues at Nazarbayev University. It is hard to say whether the “Ivory Tower” has really ever existed, but this year serious academics are in the public eye, speaking out about the economy in the media and in books. Princeton University professor Paul Krugman (Nobel Prize in Economics, 2008) appears regularly on ABC’s This Week with George Stephanopoulos. A few weeks ago, I was taken aback to hear Mary Matalin call him “a liar” to his face. Dr. Krugman seemed shocked and only blinked in reply — an uncomfortable moment. Fortunately, in print he always has valuable things to say. In his readable new book, End This Depression Now, Dr. Krugman uses clear and comprehensible language to explain that leaders in government and business have forgotten the lessons of economic history. He argues that the road out of depression is wide open and that it is time for the government to spend more until the private sector is ready to drive the economy forward again. Columbia University professor Joseph Stiglitz (Nobel Prize in Economics in 2001) recently appeared on the Jon Stewart Show, not the best venue to discuss thoughtful work. In his new book, The Price Of Inequality, he argues that the level of inequality in the United States is excessive, greater than any other advanced industrial country. This inequality is bad for economic growth and it erodes the equality of opportunity for young people. Dr. Stiglitz explains the wealthiest Americans often pursue political policies in their own interest that make themselves wealthier but impair the future for everyone else. Then the 1% convinces the other 99% that doing what is in their own best interest is also in the best interest of rank and file Americans. Furthermore, those same political policies undermine the entire economy. Dr. Stiglitz shows how Americans can construct a more dynamic and efficient economy, as well as a fairer society for everyone. 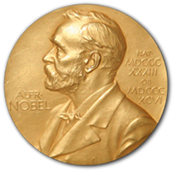 Yale University professor Robert Shiller is on everyone’s short list for a Nobel Prize in Economics, although he has not won one yet. He is best known for his book Irrational Exuberance, which predicted the economic crisis of 2008. His new book, Finance and the Good Society was originally written for his students at Yale, to explain the financial capitalist system. More recently, Dr. Shiller adapted his book to help leaders and the public understand that finance is a powerful tool for solving common problems and how it can play a significant role in helping society achieve its goals. He explains the roles of people within the financial sector, including investment bankers, mortgage lenders and securitizers, traders and market makers, insurers, market designers and financial engineers, derivatives providers etc. He also calls on these players to build good moral behavior into the culture of Wall Street and to develop new financial innovations that will continue to improve society for everyone.